I really have been knitting toward my first NaKniSweMoDo sweater, but I'm stuck on the sleeves which is BORING! So, I am showing what I've been doing in the sewing room. A few weeks ago, I ordered some scraps from WiseCraft off of etsy. It was a fun challenge to get some "surprise" scraps and decide what to create from them. 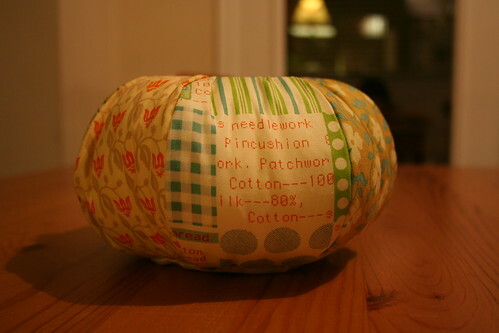 This is just one of many projects that I think I'll create from those scraps. 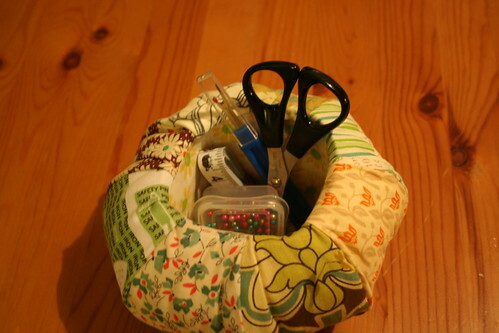 A while ago, I had seen the Pin Cushion Caddy project in "Seams to Me" that I really wanted to make for Shauna as she is going to start sewing soon. She appreciates handmade things and is one of the most creative people I know. It was fun to give it to her. All of that to say, this project was made from those scraps (and a thrifted pillowcase I found a while back) and that pattern. I think it was a great pairing! Previous post ← Diaper Cake!